Scapho-Lunate (SL) Ligament injuries are serious injuries to the wrist. The Scapho-Lunate Ligament connects two of the most important bones of the wrist together: the scaphoid and the lunate. The Scapho-Lunate Ligament keeps those small bones of the wrist moving together in a normal, synchronous fashion. Tears of the Scapho-Lunate Ligament can cause significant pain and usually lead to arthritis after 10-15 years, sometimes earlier. Scapho-Lunate Ligament injuries can occur from either repetitive overuse or from trauma, such as a fall onto the outstretched hand. Scapho-Lunate Ligament injuries lead to pain on the back (dorsum) of the wrist that is worse with activities, especially when putting pressure on the extended wrist, such as when doing a push-up, getting up off of the floor, getting out of a pool, or opening a door. The diagnosis of Scapho-Lunate Ligament injuries is suspected based on a physical examination performed by a Hand Surgeon. Tenderness over the Scapho-Lunate Ligament and pain about the ligament when extending the wrist makes one suspicious of a Scapho-Lunate Ligament injury. The hand surgeon will perform a ‘scaphoid shift’ test, which attempts to determine whether or not the scaphoid and lunate bones are moving together correctly. A negative test does not mean that the ligament is not affected, only that other supportive ligaments may be intact enough to prevent abnormal motion under the low loads used during a physical examination. On the other hand, a positive scaphoid shift test signifies a significant Scapho-Lunate Ligament injury. 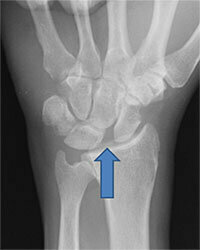 In advanced cases X-rays will reveal a gap between the scaphoid and the lunate. However, in most cases X-rays will not be helpful in diagnosing a Scapho-Lunate Ligament injury. MRI is not very accurate for diagnosing Scapho-Lunate Ligament injuries, even if dye is injected into the wrist joint (i.e. an MR Arthrogram). 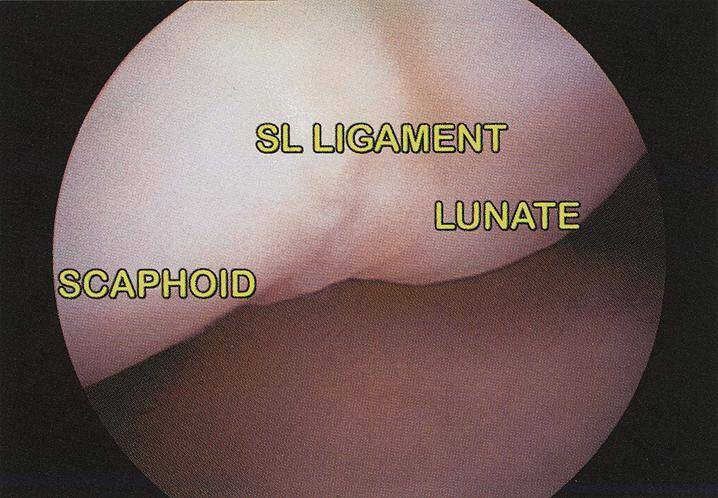 The best way to diagnose Scapho-Lunate Ligament injuries is by arthroscopy. However, MRIs are usually performed before wrist arthroscopy to rule out other problems outside the joint that the arthroscope can’t see, such as occult ganglion cysts, Kienbock’s Disease, etc. In mild cases, where the Scapho-Lunate Ligament is ‘sprained’ and not significantly torn, a splint, a steroid injection and avoiding loading the extended wrist for an extended period of time (well over a year) may be enough to quiet things down. Weight-lifting can be performed in a splint that keeps the wrist in neutral position. Knuckle push-ups can be substituted for regular push-ups, or a dumbbell or other device can be grasped that keeps the wrist in neutral position during push-ups. As an aside, although most people perform the bench press and other weight-lifting exercises with the barbell pressing their wrist back into extension, this is poor form, and can lead to wrist problems. If non-operative management fails to provide sufficient pain relief, the next step is to confirm the diagnosis and to visualize the degree of Scapho-Lunate instability. This is done arthroscopically. 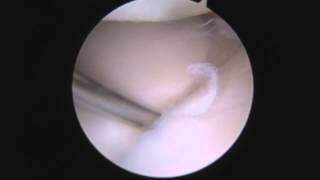 The Scapho-Lunate Ligament is arthroscopically visualized, and the degree of gapping and instability between the Scaphoid and Lunate bones is seen and graded with a small probe. Wrist arthroscopy is a quick, minimally invasive out-patient procedure that involves minimal down-time. Following wrist arthroscopy, the wound should be kept clean and dry for 24 hours. After 24 hours the dressings can be removed and the incision can get wet in the shower. Blot it dry. There are no stitches to remove (they’re buried and absorbable). There’s a piece of tape over the wound. The tape will fall off when it’s ready. The longer it stays on, the nicer the final wound may look. Please don’t submerge the incision under water (like swimming, or putting your hand under water) for 10 days after surgery. If arthroscopy reveals that the Scapho-Lunate Ligament is intact and the scaphoid and lunate bones are stable, then the pain may be coming from ‘dorsal capsulitis’, an inflammatory condition of the joint lining next to the Scapho-Lunate Ligament that can mimic a Scapho-Lunate Ligament injury. Dorsal capsulitis can be addressed arthroscopically by removing some of the joint capsule (the balloon that surrounds the wrist joint). Removing this piece of joint capsule causes no harm; in fact, this is the same portion of the joint capsule usually removed during ganglion excision. Following this arthroscopic procedure, there is no splinting and activities can be gradually resumed as tolerated. If any other problems are found within the wrist joint, they can be addressed arthroscopically or photographed and discussed later if they are too big for arthroscopic management. Theoretically, if the Scapho-Lunate Ligament injury is due to a traumatic event that occurred within the past 6 weeks in a young patient, Scapho-Lunate Ligament repair can be considered. Let me state now for the record that anything that is done to treat a Scapho-Lunate Ligament injury has at least a 20% failure rate. Period. Sometimes more. Scapho-Lunate Ligament tears are still considered a problem injury in Hand Surgery today. Many top-notch hand surgeons are starting to view the Scapho-Lunate Ligament like the Anterior Cruciate Ligament (ACL) of the knee. Both of those ligaments don’t like to heal. 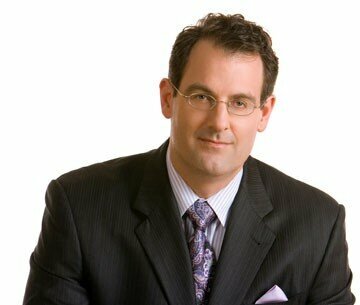 Because the ACL doesn’t heal, ACL tears are not Repaired, they are Reconstructed (ie. replaced with a tendon graft). While ACL Repairs simply don’t work, ACL Reconstructions are extremely predictable, with a 90-95% success rate. Scapho-Lunate Ligament Repairs are much the same: they have a high failure rate and a high complication rate. And a failed Scapho-Lunate Ligament repair can lead to permanent stiffness. Fortunately, Scapho-Lunate Ligament Reconstruction is a much more predictable procedure, with a low complication rate. 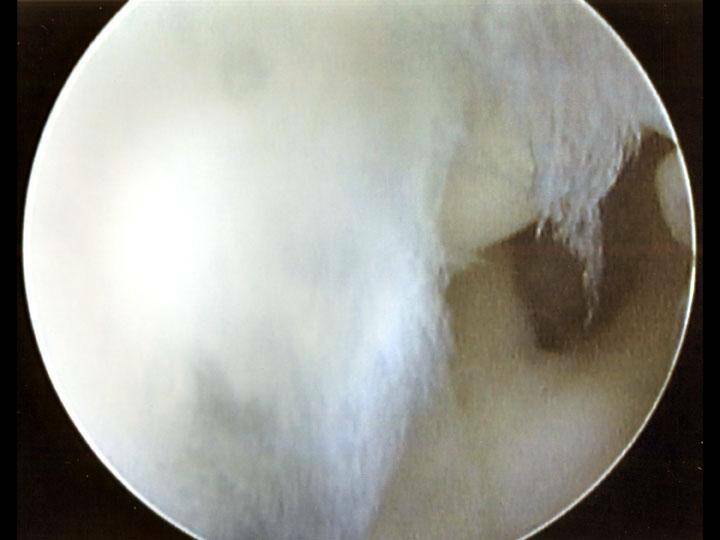 Because Scapho-Lunate Repairs only have a chance of working within the first few weeks after injury, there’s often a ‘rush to surgery’ advocated by surgeons that patients don’t feel comfortable with, especially considering the high failure and complication rate of Scapho-Lunate Ligament Repairs. Scapho-Lunate Ligament Reconstruction techniques stabilize the scaphoid and lunate by methods other than a direct ligament repair. My preferred technique, with results that I and my patients have been very happy with, is the Modified Brunelli technique. While I’d like to once again state what I’m obligated to state, that any Scapho-Lunate Ligament surgery has at least a 20% failure rate, my own experience with the Modified Brunelli technique has been much more optimistic. The Modified Brunelli Reconstruction is performed on an outpatient basis. The Modified Brunelli Reconstruction uses a tendon to substitute for the loss of the Scapho-Lunate Ligament. Roughly 1/3 of the Flexor Carpi Radialis (FCR) tendon is passed through a hole created in the scaphoid. This is then tensioned over the scaphoid and lunate bones and tied back to itself to reconstruct a tether between the scaphoid and lunate bones and reduce abnormal scaphoid motion (VIDEO). After surgery, a short arm cast is worn for approximately 4 weeks. Most people get back to their activites without significant limitation. If someone is 55-60 years or older, it may be better to simply remove the scaphoid and perform a Luno-Capitate Fusion, as detailed in the ‘Wrist Arthritis’ section of this website. This outpatient procedure involves partially fusing the wrist, followed by a cast for 3-4 weeks. It provides motion similar to what someone this age could expect from a Scapho-Lunate Ligament Reconstruction and the results are more predictable. 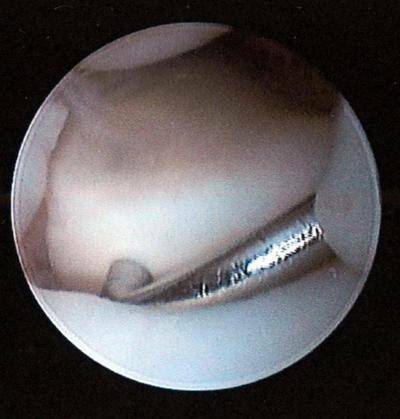 Scapho-Lunate Ligament injuries are a complex topic that is still without a perfect solution. However, if realistic goals are understood, most patients are quite happy with their surgical results. An arthroscopic probe cannot be placed between the scaphoid and lunate bones because the intact SL ligament normally holds these bones tightly together.